Les Aigrettes de la Venise Verte is a 3 bedroom recently restored farmhouse stylishly blending old beams and exposed stone with modern conveniences. There is ample space for relaxing in the sun lounge or main lounge and the sociable French style bar in the kitchen is great for wine sipping and chatting. Two of the bedrooms have en suite bathrooms with an additional family bathroom on the ground floor. Outdoor dining furniture, barbecue, hammock, books, table tennis and paddling pool are provided. 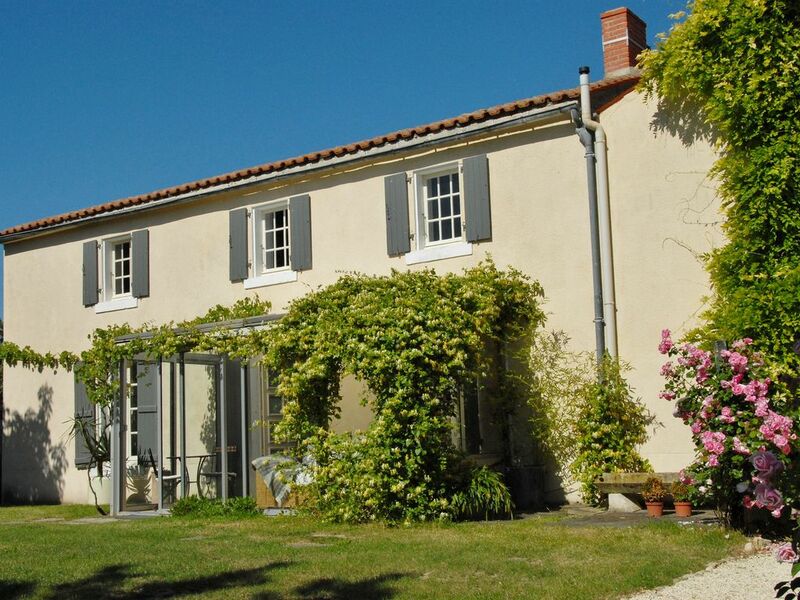 The house is situated in the Marais Poitevin which features a vast network of waterways linking to La Rochelle and the west coast and beaches (45 minutes by car). Mapped walking and cycle routes pass the house, horses can be hired next door at the equestrian centre and 2km away boats can be rented. There are many cafes, creperies and restaurants in the surrounding waterside villages which all have markets and firework festivals during the summer. Nearest supermarket and shops 5 minutes drive. We spend our summers in sunny France restoring our old barn tucked away unobtrusively next door to our farmhouse. After years of French family holidays searching for suitable gites we aimed to one day have our own French haven suiting everyone's individual needs. We wanted comfortable good quality surroundings with a bit of "boutique" style to share and enjoy. In 2006 we found our special French home set in beautiful Vendee parklands, completing the farmhouse refurbishment in 2008. Then in 2009 we fell for and updated a little 200 year-old 2 bedroom cottage yards from the beach in S.Ireland. Both are regularly tested by critical family/friends. We feel if they're happy our guests will be too and so far our testimonials bear this out. We just feel lucky to get to enjoy them both. We chose the Vendee first for its sunny micro-climate and, as Simon has a soft spot for boats, its proximity to the waterway network. When we saw the stunning scenery of "Green Venice" with its pretty waterside villages studded with walking and cycling routes, gliding boats and local fishermen relaxing at the water's edge we knew this was where we wanted to be. We desperately needed to explore this unspoilt place! Our other priority was easy access to the UK and with La Rochelle airport 35 minutes drive and St Malo and Caen ferries to Portsmouth within 3-4 hours drive respectively this area is perfectly placed. We have lavished care on the farmhouse and enjoyed scouring local brocantes to furnish it, though often sidetracked to the beach on the way! We love it and hope others will too. The farmhouse was our home out of season and therefore designed for comfort and enjoyment and is sun filled from early morning. The beds are comfy,the kitchen a joy to use,the bathrooms modern. Bedrooms are themed: Les Pierres (exposed stone, terracotta and iron 4-poster), La Lune (1 wall covered in twinkling stars on a night sky) and Zen which is completely white. We lend maps for walking, cycle and boat routes starting from the house, there's so much to do and see. Local food is mostly organic with tender Parthenay beef, Surgeles butter, regional cheeses, fresh oyster stalls on Sundays and a nearby vineyard has just produced a wine tipped to win medals. Nearby restaurants are high quality and value. Discover a secret authentic and unique watery world long enjoyed by French holidaymakers! En-suite bathroom to master bedroom with bath, separate shower, twin hand basins and WC. En-suite bathroom to bedroom 2 with bath/shower over, hand basin and WC. Bathroom, ground floor, with bath/shower over, twin hand basins and WC. Bedlinen and towels are provided but we would ask that you please bring your own cot linen. The spacious sitting room has a wood burner, 2 double sofas, comfortable armchairs, English satellite TV, DVD, I-pod docking station, WIFI (please bring your own laptop). We provide a welcome pack containing bread, butter, milk and wine for your arrival. There is mains water supply to the house providing fresh water which is safe to drink. Spacious French-designed kitchen, well equipped with induction hob, electric oven, fridge/freezer, microwave, dishwasher, farmhouse table, highchair, 1950's buffet, original stone fireplace. There are 2 canoes available for use with transportation wheels so that you can walk them down to the little wharf in the village and set off to explore the huge network of beautiful leafy canals. Choice of courses within 1 hour including an award winning golf course 40 minutes away at La Roche-sur- Yon. Notes on accommodation: Books and small selection of DVDs available. Highchair, cot (please bring your own cot linen), changing mat, stroller, sterilising kit available. Welcome pack provided (wine, bread, butter, milk). Outside: Lawned gated garden with climbing roses, honeysuckle and bamboo, hammock, table and chairs for 8. Barbecue, paddling pool, some bikes but more available for hire in the village if required. Table tennis. Large picnic area 3 minutes walk away. Ample parking space. 1 Canoe and 1 kayak available at the property, just walk them down to the launching area nearby! Utility Room: Utility area housing washing machine, airer, pegs, washing basket, ironing board and iron. You will also find dishwasher tablets, dish cloths, bin liners and cleaning materials at your disposal. Cleaning / Towels / Linen / Maid service: All bed linen provided changed fortnightly. Bathroom towels provided. Other: Sun lounge overlooking the garden with large sofa. We arrived at the farmhouse on Sunday evening, to be welcomed by the owners, Lina and Simon and a bottle of the local rose wine. Sainte Christine is a lovely part of the world with lots to explore around the house and area. Lina and Simon lovely and were a great source of information regarding the local events and would always be on hand to help should we need them.... particularly when our grandson's plane got stuck up one of the trees, Simon was there with the means to rescue it. We visited Coulon (famous for the 'Green Venice', Niort, which we found excellent and nearby Benet has a super bakery (visited often) and an Intermarche for supplies of all sorts. The children were able to go horse riding at stables next door, and the owners loaned us the canoe for boating experiences on the nearby waterway. I would go back tomorrow.....it was total magic. Thank you so much for your lovely review of your stay with us. We so enjoyed having you and your family as guests and very much hope that we will be able to welcome you again soon. We had a wonderful week. The farmhouse is situated in a quiet village. The farmhouse has all the equipment you needed and is maintained to a high standard. Local amenities are only 5 mins away by car. There is so much to do in the area - La Rochelle and the coast is only 45 mins away, nearby there are lots for children to do, waterways where you can hire canoes, and beautiful abbeys. The area has something for everyone! Accueil chaleureux. Des hôtes aux petits soins pour nous. Confortable maison, très fonctionnelle et joliment décorée dans un superbe jardin. Pour un séjour en famille avec des enfants, c'est parfait. Vivement recommandée. 15 mins drive from a fresh water lake with beach, safe swimming, pedalos, water chute and sailing school. 45 mins drive to the beaches of La Tranche, Jard and Chatelaillon, the harbour side town of La Rochelle, and the unforgettable Ile de Re with its beaches, small ports, shops and cafes. Charron is renowned for its mussels and is the place to go if you like seafood! La Rochelle airport is 45 minutes drive, Nantes 1 hour and Poitiers 1¼ hour all with a selection of car hire companies. St Malo is 3 hours by car, Caen 4 hours, Cherbourg 5 hours and the Cross Channel Tunnel approx 6 hours plus. With its close proximity to air and ferry ports the Vendee microclimate could even be enjoyed for a long weekend treat. 3 mins walk to the canal and picnic area, horse hire. 5 mins drive to Benet with quiet open air swimming pool and Monday market, St Sigismond and Le Mazeau (also baker and "cave" with large wine selection and local produce) for boat hire. 10 mins drive to Coulon on the banks of the River Sevre, museum and restaurants. 15 minutes drive to pretty Arcais in the Venise Verte, Maillezais Abbey, go kart hire, Fontenay le Comte ‘ville d'art et d'histoire’ with its shops. 30 minutes to Vouvant. Bread and pastries are delivered to the farmhouse and nearby Benet has a supermarket, range of shops, banks and a cafe. Ste Christine itself has a large Festival in mid August with craft and food stalls, sheep shearing and local horse owners racing each other around the park - not to be missed! Locals are seen regularly fishing for crayfish in the streams in Ste Christine and the Venise Verte is studded with fisherman each weekend- perch is abundant in these waterways. The area is renowned for its water ways, and the best way to see the area and its wildlife is by boat (or bicycle). There are many embarcaderes where the barques can be hired with or without a guide and there are picnic spots at the water's edge; some hirers offer nocturnal trips. Maillezais Abbey hosts ‘son et lumiere’ productions in the summer with fantastic firework displays. Niort is 20 mins drive and is set on the river, has a market each Saturday and has a large selection of good shops as well as the usual hypermarkets and chain stores. Mervent is 30 mins by car where there is a forest, dam and lake, and neighbouring Vouvant is known as the Village of Painters with its many galleries and superb views. The Futuroscope is just over one hour's drive away at Poitiers, a futuristic theme park with such activities as ‘dancing with robots’. One hour's drive to Le Puy du Fou near La Roche sur Yonne, on the other hand, features villages from different eras, gladiators doing battle and Vikings launching attacks on fortified castles. Changeover Day: Saturday is preferred changeover day. Arrival after 4pm and departure before 10am.. Notes on prices: Prices are for the property per week in UK pounds. Special rates for longer term Winter lets available on request.